Don't Bet On The Fed. Don’t Bet On The Fed. 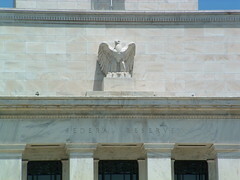 The era of quasi-religious belief in “Don’t fight the Fed” is drawing to a close; the Fed has been revealed as significantly less omnipotent and powerful than previously imagined. Many observers expect the Federal Reserve to bail out the stock market next Tuesday with an announcement of QE3, another round of “monetary easing” to reinstall the trade in risk assets. If they do, it will fail. The basic reason it will fail is that the Fed’s credibility has fallen below a critical threshold. Put another way, the quasi-religious trust in the Fed’s infallibility and power to single-handedly reverse global markets has been eroded by reality: QE2 was a monumental failure. 1. Though nominally independent, the Fed is a political construct. The idea that public opinion and political support have no influence on the Fed is wrong; the Fed’s failure to revive the economy while squandering trillions of dollars propping up banks and Wall Street bonuses was not lost on the political class. Though nobody’s talking about it, the Fed’s abject failure to revive the real economy has greatly diminished its political range of maneuver. Rumor has it that the word has already gone out to the Fed not to intervene with additional trillions to prop up Europe. 2. The consensus view is the Fed has either engineered the stock market drop to give it a free hand with QE3, or it will be “forced to do something” to combat the implosion of its pet fix to the broken economy, the “wealth effect” of rising stocks. What these views miss is the Fed is now in a no-win endgame where its best move is to minimize the damage to what’s left of its own reputation and credibility. The worst move here would be to double-down on QE3, because if it failed to goose global markets in a sustained fashion, then the Fed’s remaining credibility and “magic” would vanish in a puff of smoke. Chairman Ben Bernanke telegraphed this in his recent testimony to Congress, in which he basically stated that the Fed had done all it could and there was little more it could do other than wave a dead chicken and chant a few old incantations. Though he dutifully repeated the standard reassurances, i.e. “There is always more monetary easing we can do,” he was careful to lower expectations that such easing would accomplish anything. 3. The Fed’s power rests not in the fabled printing press but in the invisible coin of trust. Now that its fallibility has been exposed, its power, i.e. the magical faith in the guaranteed efficacy of its actions, has been destroyed. This cloak of invincibility is what generated its power, and now that its grand policy of rescuing the economy via monetary easing and “the wealth effect” have collapsed into smoking ruins, that cloak has been shredded. The folks running the Fed are not stupid, though they may be profoundly misguided. If they announce a vast QE2-type “easing,” they would be taking on a potentially fatal risk, as the entire blame for the coming debacle would fall squarely on the Fed. They know a QE2-type easing will fail, because they have undeniable evidence that QE2 failed. In other words: since they know QE3 cannot revive the economy or the market, then why on earth would they bet the farm pursuing a policy that’s doomed to fail? That would be a form of institutional suicide. While doing nothing would expose them to political heat from politicos desperate to revive the economy by any means, the Fed is not about to step in front of the train just to satisfy inept congresspeople. What is the least-risky course of action for the Fed? Announce some wimpy half-measures to dodge the accusation of doing nothing, but also avoid any grand QE3 measures which would shift the blame for the coming meltdown on the Fed. The Fed is backed into a corner of the board where all the endgame choices are unsavory. The Fed squandered all its pawns, rooks and bishops in 2008, 2009 and 2010. Its political capital has been expended pursuing policies that failed to fix the financial causes of the 2008 meltdown and also failed to revive the Main Street economy. As of yesterday, the “wealth effect” created by a rising stock market has been gutted. The Fed is on the defensive. When you’re playing defense, trying to protect your King and Queen with a single Knight, the Grand Strategy is no longer an option. 4. The limits of monetary policy are now clear for all to see. Even if the Fed announced a $1 trillion buyback of Treasury bonds, the market would go through the motions of a dead-cat bounce, but the faith in the efficacy of that policy has been lost. Neither the political class nor the market believe such a policy will accomplish anything. In other words, QE3 is dead on arrival. If the Fed announces a massive “surprise” campaign of easing, it will be accepting the entire responsibility for the revival of the U.S. economy and the stock markets. Since we all know any such Grand Gesture will fail, then the Fed would be committing institutional suicide. 5. The Fed’s easing does not push money into the economy. Thus is will necessarily fail. 6. The “risk trade” is on the order of $30 trillion. Printing $500 billion and shoveling it into the risk trade over six months is not going to offset the losses from this week, never mind the potential losses over the next six months. Add all this up and the inescapable conclusion is that the Fed will duck for cover.Maybe the market rallies for a few days, back up to the 200-day moving average in a classic oversold retrace, but the technical weakness outlined in Remind Us Again Why Anyone Should Own Stocks For the Next Two Years (August 3, 2011) cannot be resolved by QE3 for the reasons noted above. Here is a simple chart of the S&P 500, the SPX. The SPX sits on 1,200, a line in the sand going back to the days in 2008 just before the waterfall collapse in global markets. Note how the SPX bounced off 1,200 back then; perhaps history will echo as the Fed’s soothing half-measures will spark a relief rally of sorts. But then gravity takes hold and reality sets in. As noted earlier this week: since the U.S. dollar and the SPX have been on a see-saw for years, it’s interesting to compare the DXY’s recent decline with its action back in the summer of 2008, just before the global financial Ponzi scheme imploded. The Fed bet the farm last August on QE2, and it lost. It no longer has the political capital or market credibility to make that sized bet again. It is on the defensive, and in survival mode. Big bets and grand gestures have no place in this endgame. You might be interested in my new book An Unconventional Guide to Investing in Troubled Times, now available in Kindle ebook format. You can read the ebook on any computer, smart phone, iPad, etc.Click here for links to Kindle apps and Chapter One. NOTE OF THANKS: Thank you to everyone who wrote positive, encouraging emails recently–I have read and savored every one. Due to the press of events and workload, I am unable to respond at this time. To those I owe books to: please be patient, I hope to have worked through my backlog by next week. Thank you to everyone who emailed me in the past week; while I read every email, at this point correspondence is like the incoming tide and my little sandcastle of time and energy has been completely swept away. Thank you for your understanding that I am just one standard-issue individual with extremely limited time to spend on the site. charles hugh smith-Don’t Fight Bet On The Fed. Japan: PMI Contracts At Sharpest Rate In 19 Months!